Sleek, molded pistol-grip provides a strong, sure grip. Durable tubing and rugged release pouch delivers plenty of power. Shoots 1/4", 3/8" and 1/2" steel or glass shot. Includes a wrist brace for greater control & power. 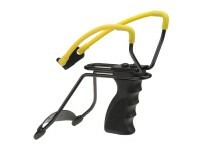 Things I liked: I purchased this because I always had poorly made or even home made slingshots as a child. well when I got this with the ease of holding it and resting the padded arm support to your wrist it made shooting a whole new ball game for me. its very accurate and very powerful for targets and small game. What others should know: the grip notice its a handle not just a straight downward piece of plastic like on some models. Things I liked: i love this slingshot! 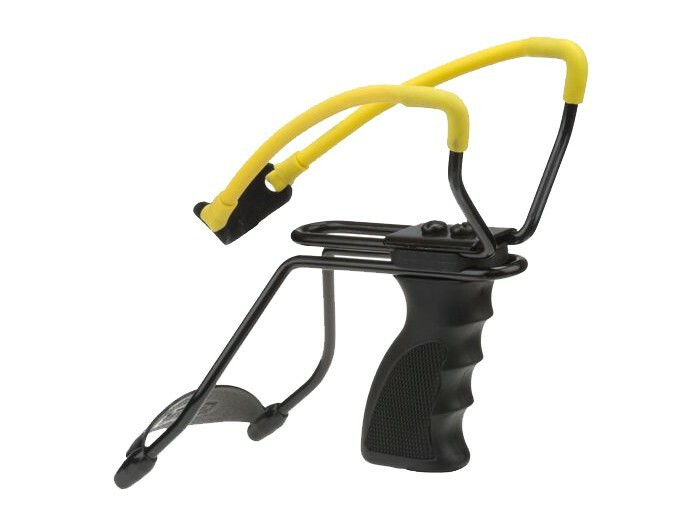 the best slingshot you could buy. My sister baught this for me for my birthday 5 or 6 years ago when this thing used to cost $25 AND it is till great! this thing has bean dropped and bounced around so much and not a single thing wrong with it. i use this for hunting and fun, i got a couple little biirds and a squirrel with this. the frame and wrist brace are both adjustable which is cool. Things I would have changed: my only problem is the screws are startin to rust but oh well it fine. What others should know: buy Daisy replacement slingshot bands. and 1/4 inch i think is best for hunting and 3/8 and 1/2 are for targets (in my case soda cans). what ammunition do you use?